That's Mat Staver on the left. 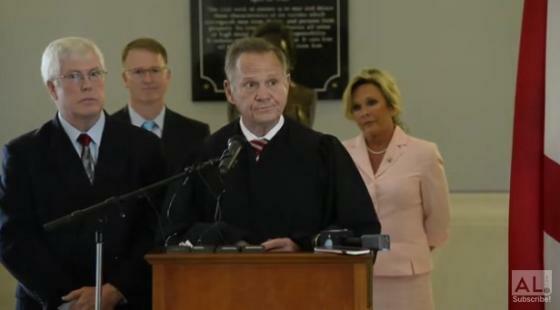 Roy Moore is at the podium. Check out the expressions on their faces. 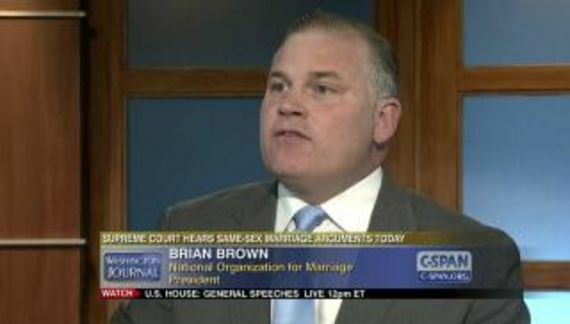 Until further decision by the Alabama Supreme Court, the existing orders of the Alabama Supreme Court that Alabama probate judges have a ministerial duty not to issue any marriage license contrary to the Alabama Sanctity of Marriage Amendment or the Alabama Marriage Protection Act remain in full force and effect. They attempted to move the case to federal court by suing the Judicial Inquiry Commission The JIC is essentially the prosecutor before Alabama's Court of the Judiciary. Today, U.S. District Judge Harold Albritton issued a ruling stating the federal district court will abstain from deciding the constitutionality of the automatic removal provision in the Alabama Constitution. Moore is undoubtedly going to run for governor in 2017. Knowing Alabama they will probably elect the Christianist crackpot. As for Mr. Staver, there are plenty of other Christianists to defend and the faithful will continue to donate to Liberty Counsel. Liberty Counsel has been designated an anti-LGBT hate group by the Southern Poverty Law Center.